Out out of sight from Church Street, our small garden, with its pond and clamshell fountain, is a small surviving remnant of the formal gardens of Catton Hall designed by Humphry Repton for Jeremiah Ives as part of the grand landscape design for Catton Park. This was thought to be Repton's first landscape commission, undertaken in 1788. On a plan dated 1800 the pond is shown as a centre feature of Humphry Repton’s formal parterre garden. The garden is now cut off from the remainder of Catton Hall and Park, but is within the village Conservation Area. After the second World War the County Council acquired Catton Hall for use as a home for the elderly. 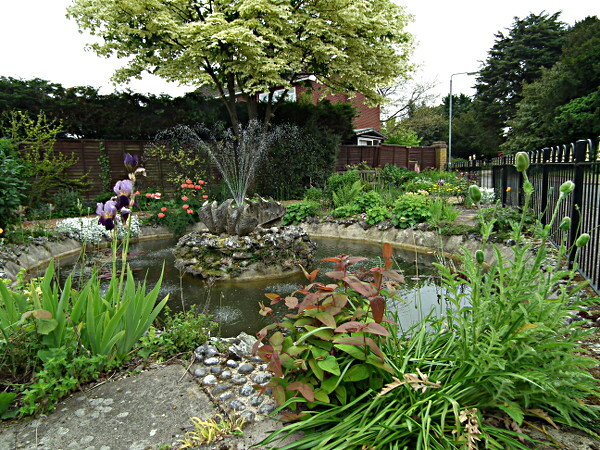 The garden and pond became surplus to County Council requirements in 1994, and were acquired by the Old Catton Society for the nominal sum of £5.00 as a conservation project, in order to save and protect this historic part of the village. The Society's action has ensured that this small but important part of village heritage has been preserved for future generations, and provides an attractive quiet corner for public rest and quiet contemplation. 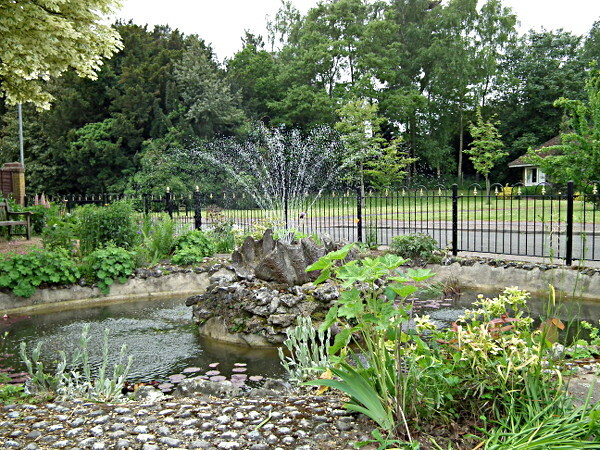 A group of Old Catton Society members worked to restore the pond and fountain. The pond was dredged, the flower beds were replanted and trees replaced. From a natural history point of view the pond, although small, is of interest, containing frogs, common newts, and at least three species of damselfly. A small group of society members now meet on a monthly basis to carry out maintenance of the garden. The fountain is still operational, but is switched on only when necessary to maintain water level, or on special occasions. At the time of acquisition the frontage of the site was unfenced; although the pond was enclosed by functional but unattractive tubular steel rails on wooden posts. The Society were concerned that the posts were unsound and, to mark the Millennium, resolved to erect replacement iron railings, more in keeping with the. character of the central part of the village. In addition to the incorporation of the '2000' date the gates contain cat and barrel motifs as found on other features in the village. Installation was undertaken by a contractor in October 1999 but final painting, together with the renovation and the installation of an additional wooden seat, was carried out by members of the Society on a voluntary basis in March 2000. That project results in a long term enhancement to the appearance of this part of the village which was formally recognised in October 2000 with a Broadland Green Award and an Award from the Norfolk Society. For all the above the Society gratefully acknowledges financial assistance from the Norfolk Rural Community Council, Old Catton Parish Council, Anglian Water, Broadland District Council and Millennium Festival Awards for All. In 2010 the pond began losing water and the rate of loss became so severe that it was uneconomic to refill continually from the mains supply. With some reluctance it became necessary to reline with cement. We are grateful to local builder Adrian Dolman (Town and Country Property Care) who undertook the work at nominal cost, using materials donated by MKM builders merchants.